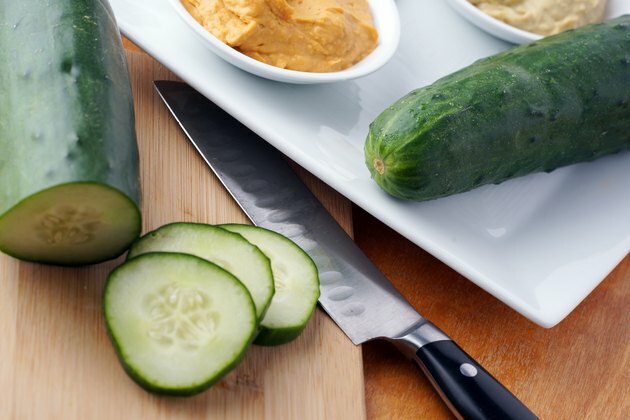 The American Dietetic Association calls cucumbers a good source of vitamin K as well as vitamin C and potassium. With only 8 calories per half-cup, crunchy, fresh cucumbers are a good choice for a healthy snack and a nice, fat-free addition to salads. Because cucumbers are generally sold whole, and their high water content means that they deteriorate quickly after being cut, you may avoid purchasing them due to concerns about waste. With proper storage techniques, however, you can enjoy a cucumber for up to a week even after cutting it. Cut only the amount of cucumber that you are going to use immediately with a sharp knife. The left-over cucumber will keep for longer if you leave it whole. Tear off a piece of plastic wrap and place it over and around the cut end of the cucumber. Smooth the plastic wrap over the cut end so that there are no gaps or air bubbles between the plastic and the cucumber, and secure the wrap tightly around the sides of the cucumber. The wrap will stick to itself better than it will stick to the cucumber skin, so overlap the plastic for a tight seal. Place the cucumber inside a zip-top plastic bag, smooth the bag flat to remove the air from it, and then seal the top securely. Place the wrapped and bagged cucumber on one of the upper shelves of your refrigerator, which should be no cooler than 40 degrees F. Store the cucumber in a part of the refrigerator that is away from any apples or tomatoes, which can cause it to over-ripen. Use the rest of the cucumber within a week of purchasing it. When you unwrap the cucumber to use it again, slice off and discard about half-an-inch of the previously cut end. Even with careful storage, the very end of the cut cucumber will dry out a little while the inside remains crisp and crunchy. If you are incorporating green salads with cucumbers to your meals don't ruin the effort with fatty dressings. Stick to olive oil and vinegar or low-fat dressing, or try just a drizzle of balsamic vinegar for a sweet taste without any fat. The same applies when cutting up cucumbers, carrots and peppers to serve as crudites with dip. 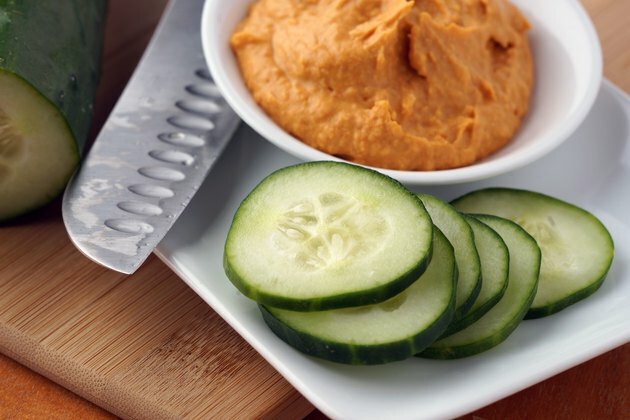 Choose a low-fat dip, such as salsa or hummus, rather than creamy or cheesy dips. When you have some cucumber left over that you don't expect to eat soon, cut it into thin slices and add to a pitcher of iced water. Throw some fresh mint leaves in too for a refreshing and fragrant drink. For a sweet version, stir in a little honey in place of sugar. Make vegetables more appealing by keeping cucumber slices, as well as other cut-up vegetables, in transparent containers in the refrigerator. Making them more visible when you open your fridge may increase your chances of choosing healthy veggies over other snacks. If you take this advice, only slice up as much cucumber as you are likely to use in a day or two.